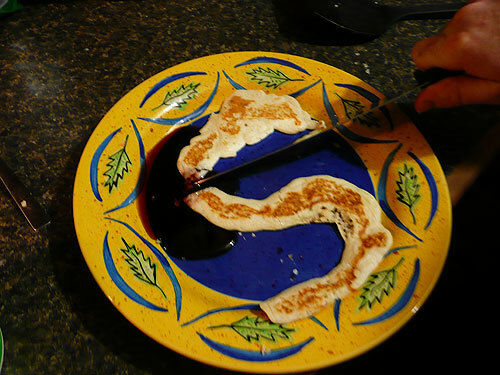 At my (non-Kemetic) partner’s urging, I woke up very early this morning to find that he had made two snake-shaped sweet potato pancakes to be ceremonially slain and nommed destroyed. We did this last year, too – it symbolizes the Uncreated One, Ap-p (Apophis), being defeated and disempowered in the new year. My partner said, and I quote, “Isfet has never tasted so good.” I laughed very hard at that, and agreed. I lit a candle, said the sunrise prayer at, um, some time significantly later than sunrise, and painted my new altar shelf. I’d spent last night taking everything down, cleaning it, and reorganizing it, and while I am not 100% done (I’ll be adding another tiny shelf for Set, Heru-wer, and the Jackal soon), I’m very pleased with how the space works right now. New shrine pictures will come in a following post, once the paint on the shelf dries! I also made a new year’s sigil for Nut/Hethert-Nut, Whose year this is. The pale blue central sigil is Balance; the corner golden one is Hope. And the stars are Hers. I did not want to answer this question, posed on the Kemetic Orthodox forums as a way to contemplate the past Kemetic year in preparation for the new one, which begins August 3rd. Ptah’s year was not a building year in the way I expected, planned, and hoped. My love and I moved to Texas shortly before the Kemetic year changed over; my job relocated me with a very promising paycheck, which we wanted to use to pay off my debts and make some serious inroads on my partner’s student loan debts. I intended to build my skillset, my network, my seniority, and my savings account. My goals were all pragmatism and foundation-shoring. Instead, I’ve endured some of the rockiest company transitions I’ve ever experienced, a flurry of managers in quick succession, and a wildly fluctuating job description. I have shifted back into my “lean times” budget with admitted reluctance (but also with gratitude that I have lived as dirt-poor before and know how to handle it). My savings account stands empty thus far. I have broadened my professional network, but only because so many people have come and gone through my office. I have increased my seniority by virtue of outlasting the roughest waves, but those who are above me now are newer than me, and so my seniority doesn’t matter a whit as I re-prove myself to them, as I proved myself to their successors and those who came before. But rather than looking to the bricks I’d hoped to lay down, what about those that were unexpected and strong? Thanks to the madhouse at work, I am tenfold a better worker in both capacity and skills. I feel I have matured greatly because of what I’ve experienced, grappled with, and adapted to. My partner and I are even more tightly tied as a family, and we were able to adopt a stray we found recently. Despite already having five cats and a dog, this new dog has fit in unbelievably well in what I had always considered was a household of critters prohibitive of having a bigger dog. My partner and our animals bring me so much joy. My crafting sort of exploded this year, unexpectedly and unplannedly. I wrote music for my gods, including my first-ever experience putting guitar to original lyrics, and I participated in a challenge to write an album in one month. I began painting. I began making sigils. I opened up Mythic Curios with my love. I began making jewelry. I began making sculpeytures. I wrote over 100k on a rough draft of a new novel in the late fall/early winter, then 50k on a rewrite of another novel idea, and almost a dozen short stories in May. I laid down the groundwork for a consistent creative habit that I intend to last me indefinitely – I am never done making things. I am incredibly grateful for the skillset, family, spirituality, and creativity that I have built in Ptah’s green year. Dua Ptah!